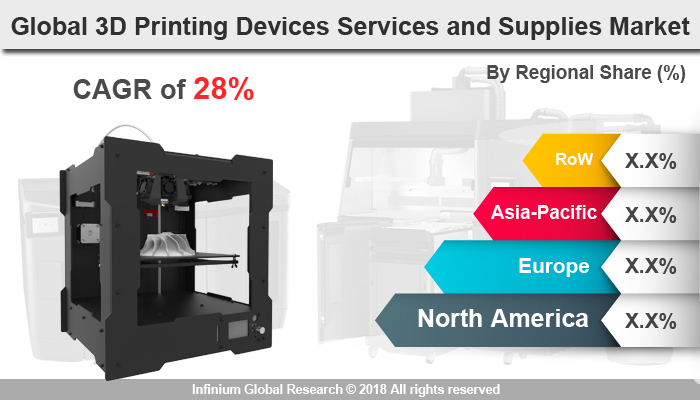 A recent report published by Infinium Global Research on 3D printing devices services and supplies market provides an in-depth analysis of segments and sub-segments in the global as well as regional 3D printing devices services and supplies market. The study also highlights the impact of drivers, restraints, and macro indicators on the global and regional 3D printing devices services and supplies market over the short term as well as long term. The report is a comprehensive presentation of trends, forecast and dollar values of global 3D printing devices services and supplies market. According to the report, the global 3D printing devices services and supplies market is projected to grow at a CAGR of 28% over the forecast period of 2018-2024. 3D printing, also known additive manufacturing creates physical objects from a digital design file. It uses input substrate materials using a layer upon layer printing method. There are seven major 3D printing technologies available today, which include vat photo polymerization, material extrusion, material jetting, binder jetting, powder bed fusion, direct energy deposition and sheet lamination. 3D printing uses a layer by-layer, particle-by-particle approach to manufacturing, it is able to make very complicated shapes that are indescribable using a traditional process such as molding, machining or casting. Various materials used in 3D printing manufacturing includes plastics, ceramics, wax, metals, sand, glass and biomaterials. The benefits of 3D printing today go way beyond just making models and prototypes. 3D printing is becoming a way of making components and products sold across the supply chain from the bracket in the aircraft door to the dental aligner in the teenager’s mouth. They are also used in dental laboratory to the jewelry retailer, from the aerospace factory to the hospital basement. 3D printing has been transforming over the past several years and there is growing evidence that the innovations in technology and materials have finally brought it beyond the publicity stage. Aerospace, defense and automotive are the most mature industries in applying 3D printing. Nevertheless, growing awareness of 3D printing in the market and a readiness to leverage the technology for prototyping, tools, fixtures and even finished products are increasing in several other industries. 3D printing is also becoming a powerful solution for manufacturing personalized and patient-specific products, along with lightweight, efficient and optimized components. Growing awareness about 3D printing, increasing benefits, increased the ability to innovate, reduced lifecycle costs by using 3D printing, and reduced time to market are few factors promoting the growth of this market. In addition to these growth drivers, the technological developments in healthcare 3D printing as well as growing government and private funding to support the development of new healthcare 3D printing technologies, and increasing demand for organ transplantation propelling the market growth further. 3D printing enables the economic manufacture of low-volume products and single-unit batches. This enables us to make both customized and personalized products that respond to the needs of consumers and patients. However, there are certain restraining factors which could hinder the market in future, which includes quality and regulatory issues, lack of sufficient 3D printing experts, challenges related to choosing the right candidate for 3D printing, reimbursement challenges and Bio-compatibility challenges. Furthermore, the emergence of cloud-based 3D printing service providers increased vertical applications, and improved market consolidation are among the latest trends would drive the market in the coming future. Among the geographies, North America dominated the 3D printing devices, services, and supplies market. The growth in the North American region is due to the established players in the U.S. Growing awareness about the benefits of using 3D printing mainly in the Medical devices, automotive, military and Aerospace Europe is anticipated to be the second largest region followed by the Asia Pacific region. Italy, Germany, France, and Sweden are the major countries offering lucrative opportunities for the players to grow in the 3D printing market over the years to come. The report on global 3D printing devices services and supplies market covers segments such as technology, and applications. On the basis of technology, the global 3D printing devices services and supplies market is categorized into extrusion, jetting, powder bed fusion, vat photopolymerization, stereolithography, sheet lamination, and direct energy deposition. On the basis of applications, the global 3D printing devices services, and supplies market is categorized into aerospace, healthcare, automotive, industrial, jewelry, and energy. The report provides regional analysis covering geographies such as North America, Europe, Asia-Pacific, and Rest of the World. In this section, the key trends and market size for each geography are provided over the period of 2016-2024. The countries covered in the North America region include the U.S., Canada, and Mexico; while the Asia-Pacific region includes countries such as China, Japan, India, South Korea, Malaysia, and among others. Moreover, Germany, U.K., France, Spain, and Rest of Europe are the major markets included in the European region. The U.S. drives the growth in the North America region, as it is the largest market in the region. In the Asia-pacific region, rapid industrial growth in India and China offer a substantial potential for the growth in the 3D printing devices services and supplies market. As a result, the APAC region is projected to experience a growth at a CAGR of x.x% over the forecast period 2018-2024. The report provides profiles of the companies in the global 3D printing devices services and supplies market such as 3D Systems, Stratasys, Materialise NV, Arcam AB, The ExOne Company, Proto Labs, ARC Group Worldwide, EOS GmbH, SLM Solutions, and Renishaw. The report provides deep insights into the demand forecasts, market trends, and micro and macro indicators. In addition, this report provides insights into the factors that are driving and restraining the global 3D printing devices services and supplies market. Moreover, The IGR-Growth Matrix analysis given in the report brings an insight into the investment areas that existing or new market players can consider. The report provides insights into the market using analytical tools such as Porter's five forces analysis and DRO analysis of 3D printing devices services and supplies market. Moreover, the study highlights current market trends and provides forecast from 2018-2024. We also have highlighted future trends in the 3D printing devices services and supplies market that will affect the demand during the forecast period. Moreover, the competitive analysis given in each regional market brings an insight into the market share of the leading players. This report will help manufacturers, suppliers, and distributors of the 3D printing devices services and supplies market to understand the present and future trends in this market and formulate their strategies accordingly.